I consider myself fortunate to be able to shoot a lot of guns through my work. Not just cowboy guns, but the variety of guns we cover through Down Range TV. I also shot and did product reviews on guns when I lived in Norway, so my finger has been on a lot of different triggers in the past 20 years. I normally categorize guns as ok, good and very good provided they can cycle the ammo and are as accurate as I allow them to be (unfortunately that is the case). I’m not complaining, but having shot so many different guns over the years, I have to admit that the times are few and far between when I pick up a gun and really get that excited feeling. This year, the excitement has been limited to the Ruger Montado (more on that in another post) and now, the 2 newest additions to my SA collection. Marshal’ette just walks past me with her eyebrows raised. Could it be that maybe me talking softly and taking these 2 beauties everywhere I go in the house is a bit weird to her? *smiling* It’s not quite that bad, but these guns are definetely something that I have taken notice of. This weekend between going to the ranch rodeo and after a long week in the office, it was nice to get out and shoot some guns, more precisely, a pair of Long Hunter USFA Rodeo in .38 Special. I admit it, I have shot Marshal’ette’s Taylor Island Girl .38s for a while in between throwing lead down range with my .45s. I decided it was time to buy my own pair in .38. I was tempted to get hold of Tammy and order a pair of the now so popular Smoke Wagons. However, I ended up calling one of our sponsors here on CasCity, Jim Finch aka Long Hunter down in Texas. 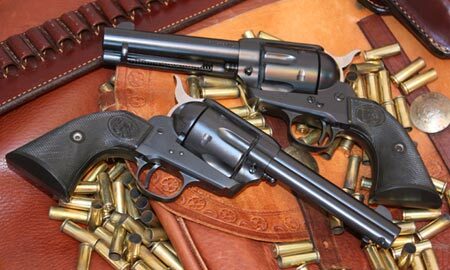 I don’t have any doubt about the quality of single action revolvers from US Firearms. 2 of the 45s I have shot the last few years are the Rodeo model. These were bought directly from USFA. They have never failed me either in training or competition. A couple of years ago, Jim Bowie (Cowboys & Indian Store) did an action job on them which took care of the 4lb, out of the box, trigger pull. If you can live without the standard casehardened blue finish and settle for a matte blue finish, as I can, the choice is the Rodeo model with a price tag of $550.00 MSRP. Taylor’s Island Girl Model set a new standard for cowboy action revolvers. Italian made Single Actions can now be purchased with lighter and more lasting springs, polished and with a trigger pull in the 2 1/4 to 3 lb area. I remember the early days of CAS where you had to have a set of springs with you at all times (especially hand and bolt springs), not to forget the struggle with a 4-5 lb trigger pull. In most cases, you ended up adding to the price tag a gunsmithing job. Today, you can choose among some very good ready to shoot guns without having to drag with you a box of parts and a personal gunsmith. We have the Smokewagons, Uberti USA now has the El Patron, Cimaron has the Model P Evil Roy Comp SA, etc.. However, USFA does not deliver any model in a competition configuration through their factory doors. However, if their models pass through the doors of Long Hunter Shooting Supply, we have a different story. 4. The factory flat “hand” springs are replaced. The frame is drilled and a Ruger style coil spring is installed for reliability. 6. Factory flat “trigger/bolt” spring is replaced with a wire spring for added strength. 7. Hammer is relieved .007″ on each side to eliminate drag marks. If you buy this gunsmithing package separate, you end up paying $175.00. As of May 2009, Long Hunter sells the Rodeo model with the gunsmithing package for $595.00 to $625.00 per gun. Mark & Derek Cookson, over at the local gun store, were the first ones to be excited when cycling the action of the Long Hunter’s Rodeo last Friday. Now it was my turn by giving it a real run on a couple of Action Targets. The first thing to do was to check the accuracy. I used my standard .38 reloads and after the first 5 rounds in each gun and at a distance of 10 yards, I could add the following to my check list. They both shot point of aim. The trigger pull on both guns were as promised, crisp and with no creep. The pull is around 3lb which suits me perfect. Not too light, not too heavy. With the widened rear sight, the sight picture came up fast and naturally and helped me to increase the speed without losing accuracy. The action timing was perfect and after 150 rounds I knew I had a pair of shooters that would be my first choice when shooting .38s. As a side note, the matte finish is perfect on a sunny day. Could be it is just me… Being a cowboy action shooter it’s easy to be excited about any type of cowboy guns that works the way you want it. These 2 Rodeos did – they delivered to the max of my abilities.Thanks to Jim aka Long Hunter for taking pride in adding a “out of box quality” to the USFA Rodeos and to an afforable price. The home of USFA Collectors & Shooter’s Society. Discuss and share with individuals who own and shoot firearms made by USFA.